Until now maximum security has not been available in a safe of the Triumph’s class. 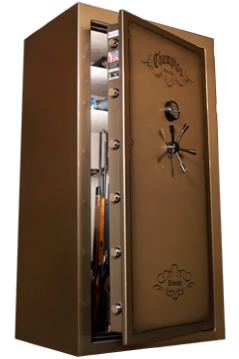 It’s heavy 10-gauge steel body with a Double-Steel Door Casement™ provides a pry-resistant fortress. The Triumph’s thick Double-Step™ door and precision cam-driven boltworks with 11/2″- diameter locking bolts provide maximum security. Double fire seals assist with a 1650° 90-minute fire rating –unsurpassed in its class. Add to this a velour interior. LED lighting, and a deluxe door organizer, and y ou complete the masterpiece. ** Depth includes 3″ for handle.